The Obama administration's proposed curbs on power plant emissions have helped open the door to an international climate change deal, the United Kingdom's energy secretary said yesterday. In an interview with ClimateWire, Secretary of State for Energy and Climate Change Ed Davey called the contentious new carbon dioxide regulations under U.S. EPA "fantastic." And while there has been little evidence yet that China or other major emitters are following suit with their own fresh targets, Davey said he is optimistic. "I am absolutely convinced the Chinese have taken a decision that they must pursue a clean energy future," Davey said. Movement in the United States to ratchet back greenhouse gas emissions, he added, "gives the political space for a deal to be done." Nations have pledged to develop a new climate change agreement to be signed in Paris in 2015. Under it, all countries -- including big developing countries like China, India and Brazil -- will be expected to contribute to emissions cuts after 2020. But working out the details of what could be the world's first truly global climate agreement has been slow-going and contentious. A midyear negotiating session in Bonn, Germany, last month moved the ball forward by inches with an agreement to circulate "elements" of a draft deal. Leaders have called for a draft text to be completed at a December summit in Lima, Peru. Davey, in Washington, D.C., this week to "explore where we are going with the international talks," called this year critical to ensuring success in the next. Coming off of meetings with U.S. EPA Administrator Gina McCarthy, Interior Secretary Sally Jewell, Special Envoy for Climate Change Todd Stern and Energy Secretary Ernest Moniz, Davey said he believes momentum is picking up. "This is a key year," he said. "You've got to create the political space, and if you don't do it now, it's too late." After barnstorming the United States, Davey said, he has plans later this month to visit both China and India, where he argued big changes are afoot. In China especially, he said, leaders are discussing a peak year for carbon emissions. He noted that U.K. researchers and others have pinpointed 2020 as a possible peak year but allowed that it could come somewhat later. "I'm not suggesting they're going to be able to peak in 2020. That's some stretch from where they are now. But maybe some could expect them to peak in 2025," he said, calling that target "very credible and very doable." Meanwhile, a major element in building momentum for Paris will be a U.N. summit slated for Sept. 23 ahead of the General Assembly meeting in New York. But expectations for that meeting also are shaky. Secretary-General Ban Ki-moon has called for leaders to bring "bold pledges." 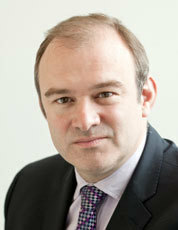 U.K. Secretary of State for Energy and Climate Change Ed Davey. Photo courtesy of gov.uk. Yet few countries are likely to announce new targets, because they are not formally required until early next year. Some leaders -- like Australia's prime minister, Tony Abbott -- don't even plan to attend. Critics have already begun to dismiss it as a talkfest. Davey, though, said those who want a climate deal should not discount the importance of talking -- particularly among heads of state. He noted that the last time leaders gathered to discuss climate change was at the 2009 summit in Copenhagen, Denmark, where a frenzied, last-minute meeting produced a result that left many unhappy. "In order to make progress, we need the political leaders of the world to come together well ahead of the negotiations to make it clear that this is a priority for them. So I think it's terribly important that they talk," he said. One issue that advocates hope will see concrete movement in September is money. A newly formed Green Climate Fund (GCF) aimed at mobilizing and dispersing money to help protect countries from the impacts of climate change and develop clean energy is just starting to call for pledges. Developing countries hope to raise $15 billion in pledges from rich countries this year. According to Reuters, Norway plans to unveil its preliminary pledge at the September summit, but the country so far stands nearly alone. The United States has not yet pledged, and leaders have made no secret that they first want to see how serious China, India and other major developing countries are about making emissions cuts. Other nations, meanwhile, are waiting to see what happens in the U.S. elections in November before deciding how much weight to put behind climate finance. Davey described the United Kingdom as "close to giving serious consideration of pledging" but declined to say when or how much. He also maintained that his country is not waiting for China or others to put their carbon cards on the table. "That has not been our constraint. Our constraint has been knowing what we are pledging money to," he said, adding that a May meeting of the GCF that finalized a number of open questions about its structure made serious progress. The United Kingdom, he said, "will be in the vanguard of people who pledge." Davey also joined the growing number of political leaders insisting that a 2015 deal in Paris need not be the absolute answer to climate change. Asked whether a deal in which countries' targets are still not enough to avert a temperature rise of 2 degrees Celsius over preindustrial levels can still be called a success, Davey said that it could. "If we can get an ambitious global deal in 2015 that is applicable to all, I think that will be a major step forward," he said. "I'm not going to set out targets for that."